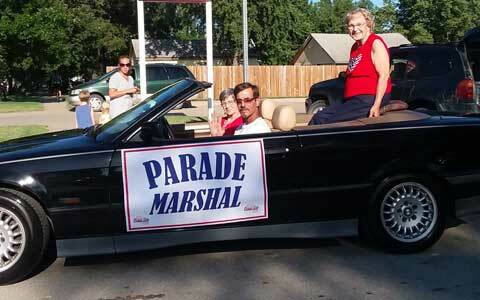 Mary Lou Estes was chosen as the 2018 Parade Marshal. Prior to her husband Bill passing away in 2013, they celebrated 62 years of marriage. 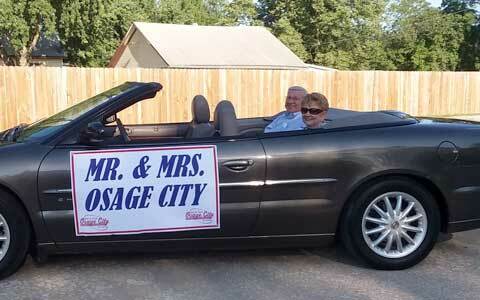 Bill and Mary Lou were also selected for the 2003 Mr. and Mrs. Osage City. They had three children, Glenda, Emporia; Ron (Susan), Wichita; Rich (deceased in 2014). Mary Lou gets extreme joy being with her six grandchildren and six great-grandchildren. Over a period of years after Mary Lou retired, she and her husband Bill hosted exchange students from nine countries including Sweden, Japan, Norway, Czechoslavakia, Italy, France, New Zealand, Thailand and Finland. Mary Lou has been a long time resident of Osage City. She retired from the Social Security Administration in 1989. Since 1989, she has been on the Fair Board and domestic science department during the fair. For several years she has served as the 4-H cooking instructor for beginning 4-H youth. She works on the election board for the Barclay Township. Mary Lou is a member of the Methodist Church, Red Hats and Jersey Creek Club. She likes to do gardening and planting flowers. Also enjoys having company stay overnight and looks forward to the grandchildren spending weekends with her. Mary Lou is always available and willing to assist when someone needs help at the school, church or other activities. Mary Lou was very excited and pleased to have been chosen for this year’s Parade Marshal. 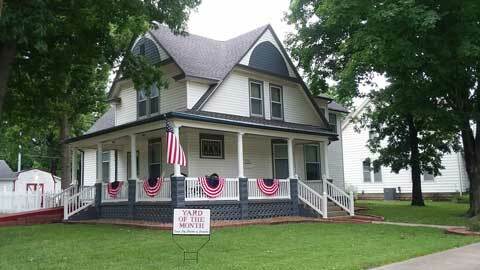 July marks the second month of recognizing a “Yard of the Month”, sponsored by the Osage City Chamber of Commerce. Recognition will be during the months of June through September. The selection of the yard takes place during the first few days of each month. In appreciation of the beauty and hard work for the selected yard, the home owners will receive a $25 Osage City Chamber Buck Certificate to be used at any Osage City business. Even through the lack of rain & hot weather, the owners are continuing to try to keep their yards groomed & looking nice. We are pleased to announce that Martin & Linda Jones’ yard has been selected for the month of July. Their home is located at 223 Lord. Click poster for printable pdf version. Click poster for a printable pdf version. Diane Michael is in charge of the parade which will be held June 28, 6:30. She is diligently working to get information to the businesses and organizations to participate in the parade. She is hoping to make it a fun filled event this year. Diane reported that she is starting to receive entries; however, she hopes that there will be many more to come. Decorated golf carts and ATV’s are invited to participant in the parade this year. Golf cart and ATV drivers must be at least 17 years of age to drive in the parade. 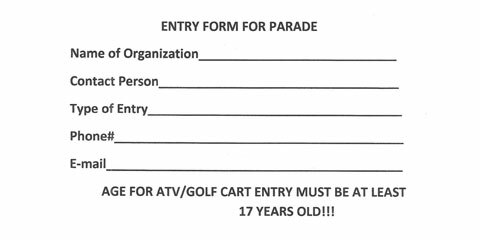 Detailed parade information including prize money for floats and golf cart-ATV, etc. may be found on the Chamber of Commerce website www.osagecitychamber.com. This year, a coloring contest for ages K through 5th grade (2018-19 school year) will be sponsored by the Chamber of Commerce. Students participating in the Summer Reading program at the Osage City Public Library can pick up the specific coloring page and return by noon June 18. Eight winners will have the opportunity to ride on the fire truck in the parade. 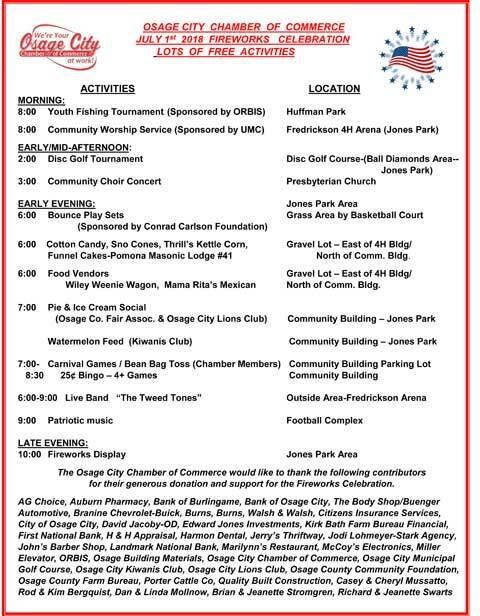 Be sure to mark your calendar for the Osage City annual community fireworks spectacular which will be held on July 1. Plans are coming together to include an exciting day of activities for the families to enjoy. There will be lots of FREE activities leading up to the fireworks display including a youth fishing tournament, community choir concert, bounce play sets, carnival games, watermelon feed, “The Tweed Tones” live band. Other activities include community worship service, disc golf tournament, bingo, balloon artist, food and snacks, pie and ice cream social. Members of the committee appreciate the generous donations from the businesses and citizens of the community to supplement the expense of the purchase of the fireworks: AG Choice, Auburn Pharmacy, Bank of Burlingame, Bank of Osage City, The Body Shop/Buenger Automotive, Branine Chevrolet-Buick, Burns, Burns, Walsh and Walsh, Citizens Insurance Agency, City of Osage City, David Jacoby-OD, Edward Jones Investments, Farm Bureau Insurance Agency, First National Bank, H and H Enterprises, Harmon Dental, Jerry’s Thriftway, Jodi Lohmeyer-Stark Agency, John’s Barber Shop, Landmark National Bank, Marilynn’s Restaurant, McCoy’s Steren Electronics, Miller Elevator, ORBIS, Osage Building Materials, Osage City Chamber of Commerce, Osage City Golf and Country Club, Osage City Kiwanis Club, Osage City Lions Club, Osage County Community Foundation, Porter Cattle Co., Quality Built Construction, Casey and Cheryl Mussatto, Rod and Kim Bergquist, Dan and Linda Mollnow, Brian and Jeanette Stromgren, Richard and Jeanette Swarts. 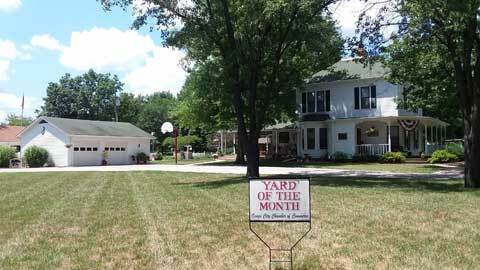 With all of the beautifully groomed yards and flower beds in Osage City, the Osage City Chamber of Commerce is sponsoring a “Yard of the Month” Recognition during the months of June through September. The selection of the yard will take place during the first few days of each month. In appreciation of the beauty and hard work for the selected yard, the home owners will receive a $25 Osage City Chamber Buck Certificate to be used at any Osage City business. We are pleased to announce that Moe & Donita Payne’s yard has been selected for the month of June. Their home is located at 633 Main. Mixer on April 27. Approximately 20 attended the event. Everyone enjoyed delicious snacks and beverages and good conversation. The course is in great shape and the golf board members would like to encourage everyone to come out and enjoy a game of golf. Available, are a variety of memberships to join which include single, family and student. The spacious Club House is also available to rent for meetings, parties, receptions, etc. Sunday morning breakfast is also served during selected months throughout the year. Many tournaments are hosted throughout the year at the course. Scheduled plans for future “After Hours Mixers” will be ECAT in July, Peterson’s Assisted Living in September and Ramblin’ Rose in December. This year, the Chamber received several excellent applications for the scholarships. The applicants demonstrated outstanding scholastic achievements and community service. The scholarship requires students to submit an application, two letters of reference, an official transcript and an essay covering “The Advantages of Owning and Operating a Business in a Small Town”. The revenue from the $5 that residents pay to be listed on the maps for the spring/fall garage sales, goes directly for these two scholarships. 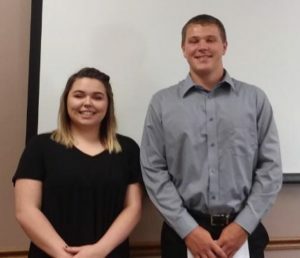 The Osage City Chamber of Commerce are pleased to announce Georgia Hutton and Carter Swindale as the 2018 recipients of our $250 scholarships. Georgia, daughter of Troy and Kerri Hutton will be attending Full Sail University in Florida. Georgia is enrolled in the Bachelor of Music Business. After her graduation, she hopes to obtain a job in the music industry and be a positive role model for girls and young musicians. Georgia’s end goal is to own her own production company and start a music label that promotes a positive image of music. Carter, son of Kevin and JJ Swindale and Tricia Gundy will be attending Emporia State University in the fall. Carter will be part of the Men’s Track and Field team as a thrower. He plans to get his degree in Biology/Pre-Physical Therapy. He will then apply to a Doctorate Program to get his degree as a Physical Therapist. Carter eventually wants to come back to Osage City and work in their family practice. We would like to wish Georgia and Carter the best of luck as they embark on the next chapter of furthering their education. It is time to plan for the Osage City Citywide Garage Sale. If you want your sale to be listed on the map please contact Casey’s in Osage City or Jodi at Vintage Park. There is a $5.00 donation for getting your name and address listed on the map. This money is used for a scholarship for a graduating senior from Osage City High School. Please support the Osage City Chamber of Commerce and this scholarship for a deserving Osage City High School Senior. The deadline to get your sale on the map is April 17th at 8AM. Contact Jodi Smith at Vintage Park 785-528-5095 if you have any questions. In Osage County the other city wide garage sale dates and contacts are as follows: Burlingame –April 7th – contact Ron Shaffer @ 785-654-3596 , Carbondale- April 14th -contact Alice Smith @ Carbondale City Library @ 785-836-7638, Osage City – April 20-21, contact- Jodi Smith@ Vintage Park @ 785-528-5095, and Overbrook- April 28th -contact Jennifer Anshutz at jenniferanshutz@me.com. When: Saturday Nov. 25, 2017. Registration begins at 7:45 a.m., race 8:30 a.m.
Prize for the best Christmas costume or the ugliest Christmas sweater! Deadline for pre-registration T-shirt guarantee is Nov. 15, 2017. Please make checks payable to OC Christmas on Market. Call or text Angie at 785-215-5497 with any questions. 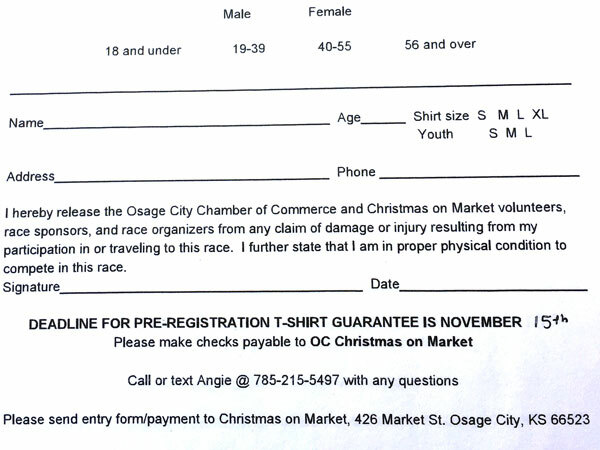 Please send entry form/payment to Christmas on Market, 426 Market St. Osage City, KS 66523. Planning is continuing for the annual Christmas on Market celebration Nov. 25. We encourage you to mark the date on your calendar and plan to shop local that weekend as many of our hometown businesses will be offering great opportunities for holiday gifts. The theme this year is: Christmas on Market 2017: “Treasured Memories”. In addition to shopping, activities will be held throughout the day including breakfast, lunch, visits with Santa, a 5K run, chili cook-off & feed, gingerbread house building, craft show, raffle, emergency services showcase, fire truck rides, ping pong drop, live reindeer, and the traditional lighted Christmas parade. If you own a business or are a part of the community, this is a great time for you to be a part of a fun community event. Let’s get together and make this great. There have been a few changes or additions to the event this year. Be sure to watch for the posters that will be in the stores & also handouts for you to take home (available soon). Some of the main changes is that the craft show will be downtown this year at the COF building which is the old Dollar General Store & the north end of the Depot. The raffle will take place earlier in the day, starting at 1:45 and located on 6th street between Main and Market streets. This year, it will be required that Winners MUST BE PRESENT TO WIN. This year, the raffle is including some very nice retreat packages, so look in the participating stores for the raffle can by the register & buy your tickets. An addition to the event this year will include a live reindeer that will be here for the day & will be available between 3:00-5:00 at the Santa Fe Park. Be sure to come by and take a look at a live reindeer and take some pictures. The reindeer will be pulling a sleigh with Santa & his elf in the parade. Diane Michael, Parade Chairman is working diligently to have a parade to remember. All individuals and groups are welcome to participate including individual floats, decorated golf carts, ATV’s (age 17 or older required for golf carts & ATV’s), marching bands, emergency service vehicles, cars, trucks, tractors. There will be prize money for float entries, decorated golf carts and ATV’s. Prize money for float entries will be 1st-$125; 2nd-$100; 3rd-$75; 4th-$50. Prize money for golf carts/ATV’s will be 1st-$30; 2nd-$20; 3rd-$10. The parade starts at 6:00 pm, judging for floats, golf carts & ATV’s is at 5:00 pm, lining up at the west end of Market street. For registration, contact Diane at 785-608-2277, 510 Holiday, m.diane27@yahoo.com. Don’t forget, the theme this year is “Treasured Memories”. We are hoping to have one of the best craft shows this year. Be sure to contact Janet Bosworth at 785-554-5039 if you are interested in having a booth in the craft show. Also, please note that the location has been moved to downtown & will be in the COF building which is the old Dollar General Store & the north end of the Depot. There will also be the traditional Jerry’s Thriftway – $200 groceries & Haskin’s Oil- $200 fuel drawing. PLEASE NOTE THE CHANGES FOR THE RAFFLE, INCLUDING TIME, LOCATION, MUST BE PRESENT TO WIN. Look in the participating stores for the raffle can by the register & buy your tickets. Artfully Quilted by Barb’s, Bank of Osage City, Designs by Diane, First National Bank, Harmon Dental, Landmark Bank, Marilynn’s, McCoy’s Steren Electronics, Osage Hardware, Ramblin’ Rose. Tickets will also be available to purchase the day of the event, at the Senior Center and at the Craft Show. There has been a change in location for the gingerbread building this year. The event will be downtown at the American Legion Post 198. The time remains the same (2:00-4:00 pm), just the location has changed. Shop in your hometown, ask anyone that you meet on the street or in the businesses “Are you the Home Town Santa?” If you are lucky & the person you ask is the Home Town Santa, you will receive $20 in Osage City Chamber Bucks to be used locally at one of the fine businesses that serve you. Christmas on Market info—A brief summary of the schedule of events & activities. The posters will be printed & distributed to businesses & outlying community businesses soon. Some of the events & activities include the Jingle Bell 5K Run/Walk chairperson Angie Theel has been contacting businesses to sponsor the event & get their name on the back of the t-shirt. Contact Angie if you would like to enter the event-785/215-5497. Entry forms are available at some businesses. Twelve (12) businesses are participating in the Retail Poker Run, chaired by Ronda Harmon. Breakfast will be provided by the Kiwanis Club. Santa will be arriving around 9:30 am. 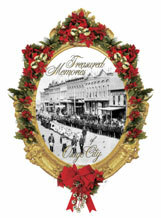 Fifteen businesses are participating in the window decorating contest representing the theme, “Treasured Memories”. Craft Show, please note that the location has been moved to downtown & will be in the COF building which is the old Dollar General Store & the north end of the Depot. This event is coordinated by Janet Bosworth, 785-554-5039. Outdoor food vendors will fill the air with holiday aromas. They will be serving lunch & food items throughout the day, starting at 11:00 am. They will be located on north 6th street between Market & Holliday streets. Also located on the sidewalk will be groups having bake sales, serving hot drinks, etc. This year there will be a new attraction which will include a live reindeer. From 3:00-5:00 pm. the reindeer will be located at the Santa Fe Park & will be available to take pictures. Children’s activities will include Osage City Public Library Story Time at the Library, Gingerbread Building, sponsored by the Osage City PTA will be downtown at the American Legion building. Santa visits will be at the Osage County Senior Center. Kathy Ayers will be in charge of the Chili Cook-Off & Chili Feed. The Raffle Prize Drawing coordinated by Barb Thompson will take place earlier in the day this year, starting at 1:45 and located on 6th street between Main and Market streets. This year, it will be required that winners MUST BE PRESENT TO WIN. The raffle is including some very nice retreat packages & the traditional Jerry’s & Haskins drawings. Raffle tickets are available for sale at ten (10) businesses. Look in the participating stores for the raffle can by the register & buy your tickets. Artfully Quilted by Barb’s, Bank of Osage City, Designs by Diane, First National Bank, Harmon Dental, Landmark Bank, Marilynn’s, McCoy’s Steren Electronics, Osage Hardware, Ramblin’ Rose. The Parade will start at 6:00 & proceed from the west end of Market through downtown. Included again this year will be a decorated golf carts/ATV’s competition category. This year, the Downtown Holiday Lighting ceremony will be held prior to the parade. The lighting ceremony will take place at 5:45. Approximately 6 businesses will be sponsoring activities in their stores throughout the day. Conrad Carlson Foundation will be sponsoring a free photo booth located at the vacant lot by Osage Hardware. The Secret Home Town Santa organized by Jeanette will be an ongoing activity from November 25 (Christmas on Market) to December 24 or until all secret Santa’s have been discovered. October 7th marked the 1st year for Osage City Chamber of Commerce to host the Flint Hills Nature Trail Fall Fest which also included the Dirty Kanza Promotions “Rush the Rails” event. The event ran from 10:00 am-6:00 pm. There were over one hundred bicycle riders & eight relay teams that traveled through Osage City during the day. There were three locations that designated the length of the trail chosen by the participants. The route starts in Osawatomie, full distance (96 miles); Vassar/Pomona State Park, half distance (54 miles); Admire, short distance (25 miles); finish line at Council Grove. Participants chose which course length they wanted to participate in. The Gilday Gas Station was the designated stopping point for the participants coming through Osage. Nourishing refreshments, drinks & first aid were provided at the stop. 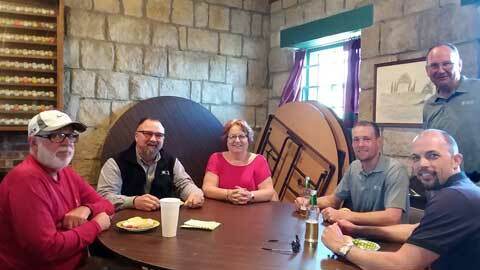 The Osage City Kiwanis Club hosted the refreshment area. Dave Azwell, Kathi Webster and Keena King, were great ambassadors for Osage City as they greeted & served the participants. There were numerous activities taking place throughout the Santa Fe Park, Santa Fe Depot and Theels’s vacant lot. The day included business sidewalk sales, bouncy house, food vendors, ice cream social, children’s activities, craft show, Restorative & Stretching sessions and a fine arts display. Dirty Kanza Promotions plans to make this an annual event, so the Chamber of Commerce are looking forward to having a bigger & better event for 2018. The 5th annual Osage City Chamber Festival of Beer is in the books. September 30th at the 4-H Pavilion, area patrons were able to enjoy beautiful weather, live music, good food and most importantly taste over 100 beers. The Chamber beer fest has turned into a great event for local and area folk as it allows all to sample several Kansas breweries and many regional and national brews. The Chamber would like to thank the volunteers that came out to help out, the Osage County Fair Board for providing the venue, Becky Siljenberg for her commitment to excellence in organizing the fest but foremost all the customers who came out to enjoy the day. 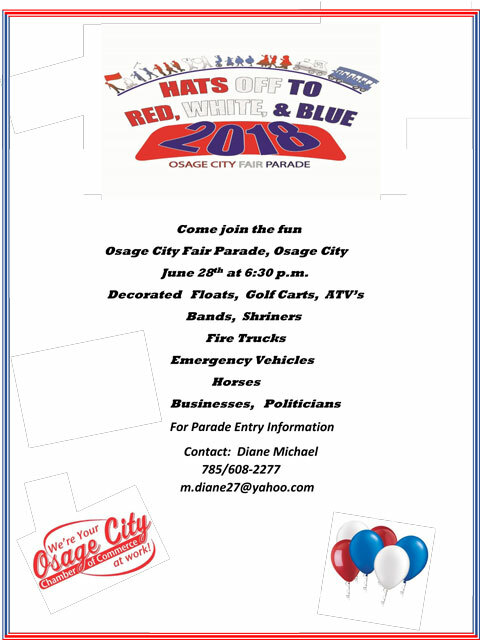 The funds from this event helps the Chamber with many different projects around Osage such as scholarships for high school seniors, the Warmth Fund, E.C.A.T., the 4th of July fireworks and many more. Thanks to one and all. As a member of the Osage City Chamber of Commerce you are more informed, better educated and directly connected to your peers. Whether you are starting a new business or you are an established business owner, membership with the Osage City Chamber of Commerce provides a multitude of opportunities to grow your business and connect to the community. 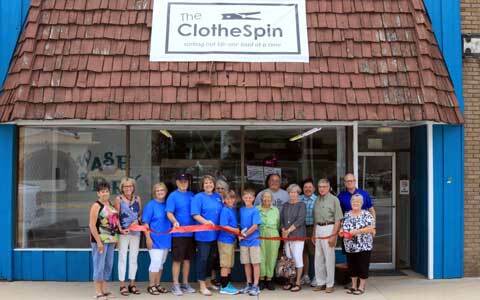 Business After Hours Mixers, monthly luncheon and ribbon cuttings. Community directory, email blast, sponsorships and advertising.